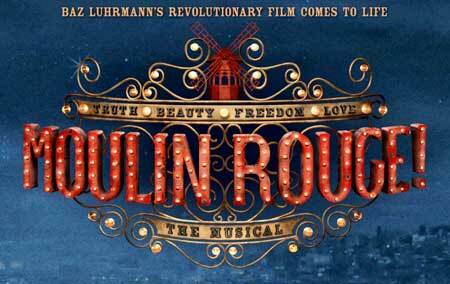 An over-the-top staged musical extravaganza based on the over-the-top 2001 cinematic extravaganza by Baz Luhrmann. It is 1899 in Paris. An American writer, Christian (Aaron Tveit), happens upon Toulouse-Lautrec (yes, that one) and Santiago, a wild Argentinian, who want to get their hoped-for theatrical production off the ground with the help of Harold Zidler (Danny Burstein), head of the Moulin Rouge, a bohemian hybrid of club, bordello and theatre. 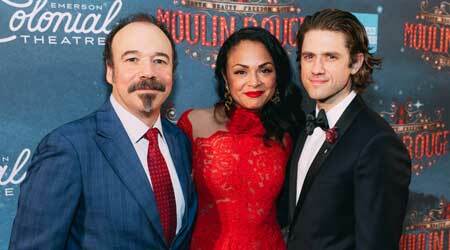 Through an unintended mix-up, Satine (Karen Olivo), the star and celebrated courtesan at the Moulin Rouge, gets romantically aligned with Christian, though Zidler’s intent was to have her seduce the Duke of Monroth (Tam Mutu) so that he would be induced to support the Moulin Rouge in its current financial difficulties. Indeed, the Duke gets seduced, takes over the Moulin Rouge, and the errant theatrical production gets underway. Meanwhile, Christian and Satine carry on their heartfelt romance while Satine carries on a less heartfelt one with the Duke. After producing and directing a stunningly crafted and hilariously oddball early classic about competitive ballroom dancing in Australia, Strictly Ballroom (1992), Baz Luhrmann surged way over the top with his Bollywood-inspired Moulin Rouge (2001). It is like Fellini on drugs – so lavishly weird in all sorts of ways that it’s entirely enjoyable in its daringly offbeat design and technique. The camera movements and the edits are all jolting and sharply done, unsettling and stimulating to the point of intoxicating nuttiness. The costumes are way out there, as is the art direction, for which the film won an Oscar. Its three stars, Nicole Kidman as Satine, Ewan McGregor as Christian, and Jim Broadbent as Zidler, all superb actors, manage to shine in this wild improvisation. As well, the film makes lots of references to familiar song lyrics, and it’s plenty of fun to identify them in the patter of the dialogue. The current showbiz adaptation of the film headed for Broadway takes an already hyper-juiced film and puts it way way over the top. It’s brash and relentless in practically all ways, setting the goals of its extravagant production very high in anticipation of a lollapalooza run. One of the obvious catchy things about this current adaptation is its more explicit quotation of the array of familiar songs in musical form than the film captures. Whether it be The hills are alive with the sound of music from the musical The Sound of Music (1959), Diamonds Are A Girl’s Best Friend from the musical Gentlemen Prefer Blondes (1949), Sympathy for the Devil from the album Beggar’s Banquet (1968) by The Rolling Stones, or endless tunes by Elton John, the music, even in very abbreviated snatches, is there. The audience seems to go wild over this and endlessly enjoys the familiarity of each musical quotation. The set is also way out there, and I imagine its cost is way out there too. 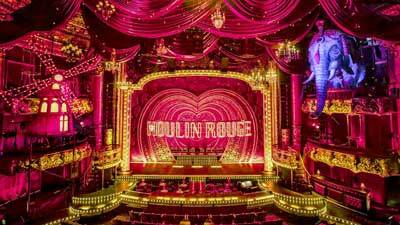 There are huge models of a mill (French: moulin) and an elephant (Satine’s iconic dressing-room) suspended from the upper reaches of the beautifully redone Colonial Theatre auditorium. Overlapping stage drops of increasing complexity appear in rapid succession, and there is a heavy supply of strobe lighting and associated tricks to embellish the already visually reverberating sets at any given moment. Overall, the production is big, brassy, highly amplified and visually overwhelming. Many of the performances, as well, have been directed to be broad and brash. Danny Burstein, who played an excellent Tevye in the 2016 revival of Fiddler on the Roof on Broadway, is a boisterous but engaging Zidler. His role is conceived brashly, but he manages despite that to make Zidler into an unexpected dramatic focus of the wild goings-on. He has a decent voice, so when he gets a chance to sing, rather than scream, he does so convincingly. Aaron Tveit, as Christian, in the romantic lead, has a sweet singing voice that gets a little thin in the higher ranges but which overall does the job very reasonably. He also makes an appealingly boyish artiste. Karen Olivo, as Satine, is an actress who won a Tony for Featured Actress in a Musical for her outstanding performance as Anita in the 2009 revival of West Side Story on Broadway. Capable as singer and actress, she fills the bill as the siren-star of Moulin Rouge, but the chemistry with Tveit’s Christian is oddly off, seeming like she should be his governess rather than his paramour. In the film roles, Nicole Kidman and Ewan McGregor, both radiating an inner innocence, provide a better chemistry. Here, Olivo’s Satine seems too burnt out to be up for an energetic romance with the youthfully exuberant Christian. Her cynical relationship with the Duke, played with an exquisite acidic malevolence by Tam Mutu, seems considerably more suitable, but that does not suit the story very well. In other performances the singing goes on at a quite energetic pitch and is in tune much of the time. When it isn’t, the sheer force and volume of the voices intoxicate the audience into revelry. The choreography has a relaxed rather than taut feel, perhaps, interpreted in the most positive way, intended to convey offbeat bohemian sensibilities. Amazingly, the script often echoes the film so closely in its details that one has to marvel at the sometimes almost xerographic ingenuity of its authorship. The audience with which I saw the show seemed thrilled by just about everything. The almost consistently loud, brash and visually dramatic tone of the production and its endless quotations of familiar tunes certainly hit the mark with that target audience. Not exactly musical theater, but more like a musically and visually enhanced theatric extravaganza, this enterprise, like so many other Broadway-bound endeavors of this age, takes familiar subject-matter and raises the ante on it, betting that a lot of people will want to relive their fond memories of familiar material by raising the voltage on it a few thousand times. It is truly a thrill to see the Colonial Theatre back in fine form under the auspices of Emerson College. It looks dandy and is definitely worth seeing.